..Tate Zawadiuk first began playing the ’cello two days before his third birthday. When he turned 12, he had his début as a soloist with the Vancouver Symphony Orchestra, and was again featured as the soloist with the VSO for its 2011 Deer Lake concert and Vancouver 125th Anniversary concert in Stanley Park. For two consecutive years, Mr. Zawadiuk has been a finalist in the International Concerto Competition at Morningside Music Bridge and performed with the Calgary Philharmonic on both occasions. As a soloist, he has performed with the Vancouver Philharmonic, Vancouver Youth symphony, Vancouver Academy of Music symphony, New Westminster Symphony, and Richmond Symphony Orchestras. He has performed in Master Classes for many world-class ’cellists such as Aldo Parisot, Colin Carr, Lynn Harrell, Daniel Müller-Schott, and Johannes Moser. In 2013, he performed as a soloist for the High River Gift of Music series and with his trio at the Festival of the Sound and the Ottawa Chamberfest. Most recently, Mr. Zawadiuk has received acceptance to the Juilliard School and the New England Conservatory of Music. This summer, he has been invited to attend the Banff Master Class series. He studies with John Kadz and Johanne Perron in Calgary at the Mount Royal University Conservatory as well as with Ariel Barnes in Vancouver at the VSO School of Music. Mr. Zawadiuk’s ability to convey his passion for music makes for a truly captivating performance. 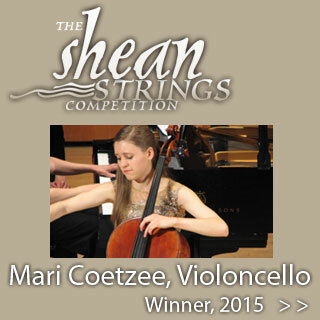 The application process for The Shean Strings Competition 2015 is now closed. We received 20 applications, and have selected our competitors.